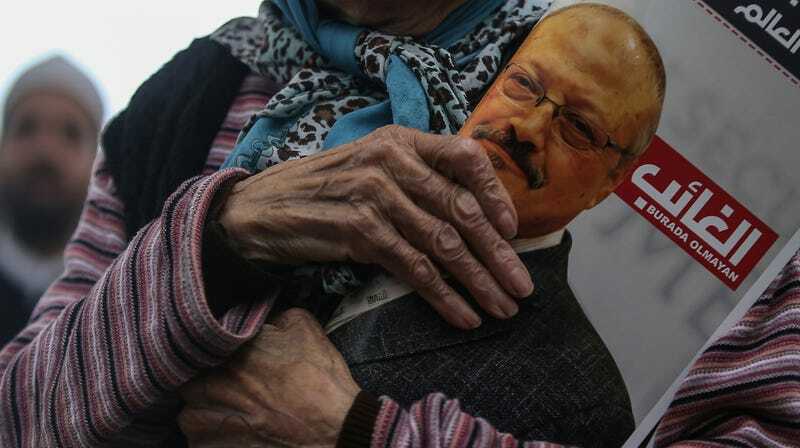 A woman holds a poster during the funeral for dissident Saudi writer Jamal Khashoggi. Human rights campaigners are accusing Saudi Arabia of torturing several women’s rights activists using electrocution and flogging. The activists, who have been imprisoned since May, are also alleged to have been subjected to sexual harassment, according to Reuters. Over a dozen women’s rights activists have been arrested over the last six months, most of whom fought to end Saudi Arabia’s guardianship laws, which require women to get permission from a male relative for decisions ranging from enrolling in school to obtaining a passport. The arrests “followed an earlier crackdown on clerics, intellectuals and activists in September 2017, in an apparent attempt to silence potential opponents of the country’s de facto ruler Crown Prince Mohammed bin Salman,” reports Reuters.